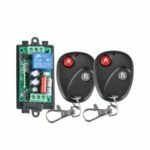 This wireless relay switch is a simple way to turn on your low voltage load. 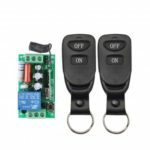 Suitable for security alarm, remote control electric doors and windows, signal control and etc. Easy to install and use. Compact design, suitable for any 3.7V/4.5V/5V/6V/9V/12V devices or lights. 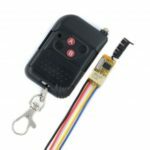 Save you from messy wiring and time consuming work by using a wireless remote to switch on your load from a distance. With 3 working modes: momentary, toggle, latched adjustable. The receiver only works with the transmitter which use same code. One/several transmitters can control one/several receivers simultaneously. 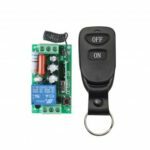 Suitable for security alarm, remote control electric doors and windows, signal control.